I don’t have much to report about my ongoing battle with the school system. I wrote a letter summarizing our meeting from last week and included requests for specific information on the budget as well as answers to several questions. I am still waiting for a response. In the meantime, I’ve made phone calls to attorneys and advocacy groups and am learning what my options are. Rest assured I will be taking action soon! Navigating the legal and political bureaucracy when facing problems like this is extremely time consuming. You have to take breaks and step away from the situation to clear your head. Fighting an organization as large as the school district is a long process, and, just like in a marathon, you have to pace yourself. From my experience, organizations, when faced with challenges from those they serve, strategically hide behind their many layers and levels of management. They hope we will eventually become frustrated enough to give up our cause. Private insurance companies, State Medicaid offices serving the disabled, and school systems like I am now dealing with all employ these tactics. As parents of special needs children, we have many extra issues to manage. Taking an occasional break from advocating for a cause is not giving up. It’s a necessary means of balancing your life, completing other projects, and enjoying your family. Nevertheless, it’s hard for me to watch too many days go by without a resolution for Peter. The FM system he used in school for the last three years is collecting dust somewhere in an office simply because he is enrolled in a private school. It’s saddens me that we have such a limited ability to govern where our tax money is spent for education. To me, “equitable services” as outlined in IDEA law means that private, public, and home-schooled students should all have equal access to assistive technology as needed. To our local and intermediate school districts, it simply means a balanced budget, even if it comes at the expense of kids with special needs. How sad and pathetic is that! Our Craniofacial Acceptance Month picnic was a success! I recently held my first Craniofacial Acceptance Month Picnic in my hometown of Round Rock, TX, just north of Austin. Although we didn't meet any more craniofacial families, we did have a pretty good turn out. There were a few families from the boys' school, as well as some neighbors and friends. And while I was so appreciative that they came out to support, I was the most excited about the complete strangers that stumbled upon our event and stopped to find out more about our efforts. My mom was kind enough to donate money to rent a bouncy house, which made it just about impossible to miss our group at the park. It drew a lot of people over to see what was going on - most thought it was a private birthday party and shied away, but I encouraged them to go right ahead and play as I chatted with their parents about why we were there. I was a little nervous that nobody was going to show up at all as it was kind of a slow start, but my husband reminded me that even if we were able to talk to just one or two families in the community to spread awareness of CCA and craniofacial differences, it was going to be worth it. So when all was said and done and around 30 people had come and gone I was really pleased. The school that the boys attend donated bubbles for the kids and collected chips from the kids families for the picnic. Our local grocery store, HEB, gave me $50 in gift cards to purchase all the drinks. Everyone had a great time - our friends, who already know Aiden's story, were still able to learn a little about what CCA does - and the others, who we've never met before or only just briefly, learned a lot about Aiden, what he's been through, who CCA is and how they help families like ours. All in all, the picnic was very well received and I look forward to hosting one again next year. Hopefully I will be able to attract more craniofacial families and others from the community to come out and enjoy themselves. * If you hosted or attended a picnic in your area, we'd love to feature you here on the blog! Email your pictures and a short write-up about the event to ccakidsblog@gmail.com. Our Kids Must Learn to Advocate! This comment got my blood boiling on several levels. Firstly, it set a confrontational tone for our upcoming meeting before we even met. Secondly, I don’t like being told by a stranger what I can and can’t do as a parent. Finally, this issue is 100% about Peter, and I, as his parent, do feel that he has every right to participate in any discussion relevant to him. Consequently, I went into the meeting already disliking this person. Thank goodness the Principal of Peter’s school attended the meeting with us. As parents, we are often too close to the issue at hand. Our emotions can quickly take over because these problems are personal in ways that those who do not walk in our shoes can’t possibly comprehend. I highly recommend having a knowledgeable voice of reason along with you! We did not come to any resolution during our meeting. Many of the arguments were circular, and I don’t feel that any of my questions were answered. I did at least leave with more information and insight than I had going in as well as what our next steps will be in our attempt to reverse this decision. I asked Peter what he thought of the meeting, and he said that he didn’t really understand the conversation. I told him that I didn’t expect him to but that it was important for him to see the process. He witnessed a parent standing up for his rights, the expertise and support of his Principal, and the communication of adults disagreeing in a professional setting. I don’t regret for one minute that he attended our meeting. We must teach our kids how to advocate on their own behalf so that they will have those skills as adults. I left our meeting with a deep sense of dissatisfaction. Later in the day, I immersed myself into drafting a summary letter of our conversation. As I know from experience, everything must be documented! Events like this leave me exhausted, and they consume a great deal of my time and energy. I felt uneasy and distracted all week leading up to this meeting. As Peter’s Mom, I have an extra obligation to fight for his rights. It’s just a shame that these issues consume so much of our precious family time. I always look forward to some interesting stories on our drive home after school. Jacob, my 1st grader, came out of school one day this week and reported that he was moved from “green” to “yellow” for his behavior that day. He said he got in trouble for talking in line while the class was in the hallway. Peter, in his typical big brother way, says to Jacob, “Well, I’m not surprised. I knew it was only a matter of time before you got in trouble for talking. I mean… not to be mean or anything, but you do talk a lot.” I started laughing so hard I almost had to pull the car over! Now that school is in full swing, the homework load is picking up. Peter, now in 5th grade, is definitely seeing an increase in his workload. Like many ten-year old boys, he would like nothing more than to come home and play video games all night. After telling Peter 3-4 times to turn off the game and finish his homework, I took action and told him that he had lost his video game privileges for the next day. That got a reaction! He defiantly looked up at me and said that he didn’t think I was talking to him. I said, “Who else is playing a video game?” Well, he says, “I only have one ear and it doesn’t work that great sometimes!” Don’t even try that excuse in this house I said (trying not to laugh) because it will get you nowhere. I have to give him credit for being creative though! My fight to regain an FM system for Peter at school continued this week. I wrote a letter stating my concerns and requests, and I was able to schedule a meeting with the district's Director of Special Services. I am thrilled that the principal of Peter’s school will be attending the meeting with me. I also want Peter to participate, even if only in a very limited way. I feel very strongly that he should be a part of this process. Our kids have to learn how to advocate for themselves as they transition into adulthood. In preparation for the meeting, I am reading up on anything I can find about Michigan special education law and private schools. Stay tuned for updates via the blog. This week marks the beginning of a new school year in Michigan, and our boys are off to a fantastic start. 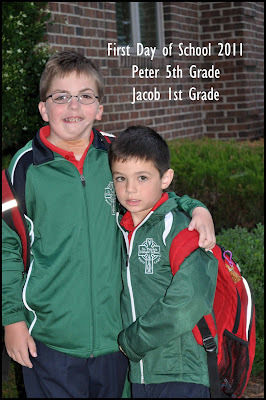 Peter started 5th grade and Jacob is now a big first grader. Typical of the first week of school, I’ve filled out about a million forms. With a child like Peter, there is always a lot of extra paperwork to ensure the staff is informed of his unique issues and related medical background. As Peter has attended the same school now for several years, it is comforting to know how well the staff and his friends care for him. The public district that services Peter’s school has been very helpful in providing him with hearing-related services and assistive technology via an FM system in his classroom. This year, however, the district has decided that kids who attend private school should no longer benefit from such assistance. I find it extremely frustrating that this system has been provided by the district for the last three years but is now suddenly taken away. Why? Peter’s hearing needs are exactly the same as they were in previous years when he was always, without question, granted an FM system. Did this affect students in public schools? No. They will continue benefitting from services. This is strictly about money. If this had been the case from the beginning, I would be much more accepting that this is our choice of private vs. public. To provide something for several years, however, and remove it for no logical reason is quite baffling.